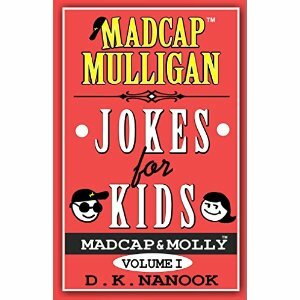 I bought "Madcap Mulligan Jokes for Kids: Volume I" by D.K. Nanook for my nine-year-old niece (she's a big jokester), and she loved it. The print is relatively large and the formatting is easy on the eyes, perfect for young readers who aren't ready to sift through a bunch of text crammed onto a page. The jokes are clean and very funny. There's a good mix of different topics to keep the reader interested. Although the book is aimed at kids, adults will get a kick out of the jokes, too.